Malini Devi Dasi from Malta gains some insight to what goes on behind the scenes leading up to the celebration of Sri Gaura Purnima festival, and shares the experience of travelling through Bengali villages on such preaching and collection programmes. We are armed with a mrdanga, karatals, a stack of yellow invitations to the Nabadwip Parikrama with a picture of Lord Chaitanya on the front, and several white preaching pamphlets, their Bengali script looking pretty to my Western eyes. We also have a media-projector and a few old sacks. Sri Gaura Purnima is the next large festival due at Sri Chaitanya Saraswat Math. This festival will draw around 4,000 people world-wide to its Nabadwip headquarters. Although it will be almost two months before the festival culminates on the 21st March this year, on the full moon of the month of Phalguna, preparations are already under way. A steady stream of preaching programmes, beginning January-February through to the festival, enables collection of approximately 500 'mounds' of rice of 40 kg each. Furthermore, 500 bags of potatoes, each containing 50 kgs, are usually collected just prior to the festival, as at this time many crops are not yet ready. This intensive bhoga collection is indispensable to cater for the huge amount of prasadam distribution during the week of the Nabadwip Parikrama leading up to Gaura Purnima. Apart from leading his own team, Sripad Acharyya Maharaj directs another preaching and collection party, with Visvarup Prabhu and Jadu Gopal Prabhu, which travels through other areas of West Bengal. On this particular trip, Sripad Acharyya Maharaj's group includes Poresh Prabhu, Amarnath Prabhu, Sudev Prabhu, Nikunja Krishna Prabhu, Nimai Chandra Prabhu (Venezuela), Nowl Kishor Prabhu (USA), Kamala Nayan Didi (Venezuela), and myself. 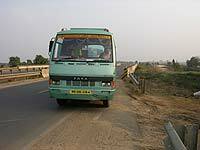 Satinath drives the bus transporting the devotees, and Bipul Krishna Prabhu meets us at our first location, making his own way from the Dum Dum Park temple. 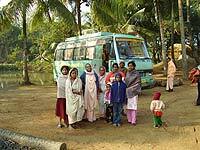 As the bus speeds along the bumpy roads, Sripad Acharyya Maharaj explains that since we move steadily from house to house, we hold small-scale house-programmes, unlike the recent event held in Uluberia on 05-06 January. These programmes are intended mainly for bhoga and pranami collection, but also to distribute invitations to people to visit our temple in Nabadwip, and especially to join the parikrama and Gaura Purnima celebrations. Sripad Acharyya Mahraj says that his preaching around West Bengal began in 1994, three years after he joined the mission. Initially he used rickshaws or went on foot, but due to the weight of the rice being collected, he sometimes rented a car. Eventually, Srila Gurudev, Srila B.S. Govinda Maharaj, gave use of his Ambassador car, which is now in the Centenary Memorial Museum. Maharaj smiles as he recollects those days, and goes on to tell how, in 2004, by the mercy of Sripad Avadhut Maharaj, a Tata vehicle was purchased for seven lakh rupees. A deposit was paid and then installments were paid every month. After one year, the truck was converted into the green bus we are travelling in, which bears 'Sri Chaitanya Saraswat Math (International)' in big, yellow letters on its side. Asked how he goes about planning his tour, Sripad Acharyya Maharaj explains that years back he began by visiting initiated devotees, but soon invitations began to be extended to visit their married sons' and daughters' families or their friends. 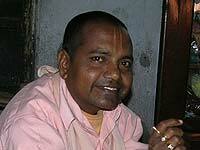 Soon, the number of devotees and the network of contacts began to steadily increase. Year after year they are very happy to serve the temple by donating some kilos of rice grown in their own fields. Meanwhile, many groups sometimes visit Sri Chaitanya Saraswat Math by their own arrangement. Sripad Acharyya Maharaj talks with many of these visitors, and particularly interested persons sometimes extend invitations to him to visit them, holding a house-programme for their family, friends and neighbours.